As Sebastian Vettel won easily from pole ahead of Jenson Button, all sorts of mayhem and mischief occurred behind him. Fernando Alonso was fighting with Lewis Hamilton for the final spot on the podium - tricky, considering his DRS was broken. Hamilton was weaving all over the place to defend but eventually Alonso got a run on him, only to clip his front wing on the back of the McLaren, forcing him to pit for a new nose. He eventually finished sixth while fading tyres meant Hamilton dropped to seventh, and after the race both were handed 20-second penalties - Hamilton for weaving, Alonso for causing a collision, which was unusual considering that the only person’s race Alonso spoiled with the contact was his own. Not that it really mattered, since the penalty didn’t affect his finishing position, while Hamilton dropped from seventh to eighth. The Renault drivers had contrasting fortunes. Nick Heidfeld drove brilliantly to finish third, taking the 13th (and final) podium of his career and beating Stefan Johansson’s unwanted record for the most podium finishes without a win. 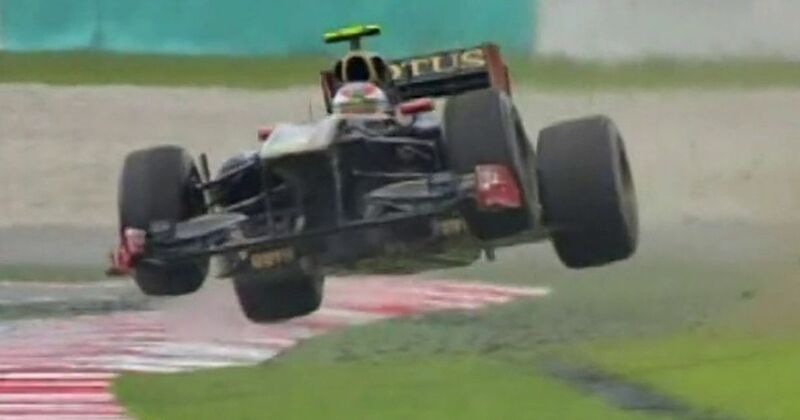 Meanwhile, teammate Vitaly Petrov was running in eighth when he ran wide, floored it across the grass launched it into the air as he hit a lip in the grass. As he landed his steering column completely broke as his steering wheel fell into his lap - luckily he was able to come to a safe stop without anyone else being involved. Naturally, the whole thing was photoshopped into oblivion. Mike Hawthorn (born 1929) made his debut in 1952 and after some impressive results for Cooper was signed by Ferrari. He beat world champions Juan Manuel Fangio and Alberto Ascari in a straight fight to win his first race in 1953 and followed it up with another the following year. After a few patchy seasons, in 1958 he used sheer consistency to beat Stirling Moss to the championship by one point. In a season where only the best six results counted for the championship (and when points were given for fastest lap), his five second places, one win and four fastest laps proved better than Moss’s four wins, one second place, and three fastest laps. Hawthorn and his trademark bow tie didn’t return to defend his title as he retired at the end of the season, only to be killed in a road accident a few months later. Carel Godin de Beaufort (born 1934) was something of an eccentric amateur racer who, on occasion, was known to race without wearing any shoes. He raced in F1 between 1958 and 1964 (mostly in a bright orange Porsche) and despite his amateur status actually managed to score four points during his career courtesy of a number of sixth-place finishes. Sadly, he died in an accident during practice for the 1964 German GP.